The word “icon” shouldn’t just be thrown around willy-nilly. But hey, the Mazda MX-5 Miata is a bit of an icon. This world-renowned sports coupe is back yet again for the 2019 model year. The RF model of the MX-5 Miata has been increasingly popular because of its hard-top roof. The standard MX-5 Miata is great, but some drivers like the look and security that comes with the steel roof as opposed to the cloth top. While it has great style, the MX-5 Miata is better known for its performance. Learn more about that below. Anyone who follows Mazda and knows about the lineup should know that its vehicles all feature great performance and engine specs. The 2019 MX-5 Miata RF comes with a SKYACTIV®-G 2.0L 4-cylinder engine. At 7,500 rpm, the re-engineered Miata generates 181 horsepower. That amount of power packed into such a compact ride makes for a thrilling experience any time you press the gas pedal. And it does so at a very efficient rate. 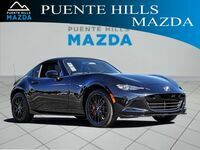 The 2019 MX-5 Miata averages up to 36 highway mpg, 27 in the city, and 31 combined mpg. Remember, your fuel economy is always subject to change depending on your driving habits. There is a lot more that this sports car has to offer. Everything from its technological interior to its sharply contoured body is top notch. 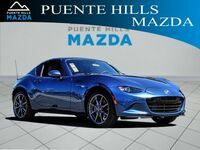 Come down to Puente Hills Mazda and check it out for yourself. Our sales team will answer all of your questions and go over everything else you need to know. We hope to see you soon! Interested in a Mazda MX-5 Miata RF?